This article describes the sustainability legislation and regulations influencing UK building design and construction and some of the most significant other (non-mandatory or voluntary) drivers. The focus of this article is non-domestic buildings although many of the measures described are equally applicable to domestic buildings. Despite the significant number of initiatives relating to sustainable construction undertaken in the UK in recent years, there are only a few, albeit important, mandatory requirements. In addition, UK Government’s deregulatory and growth agendas over recent years have reduced the emphasis on regulatory pressures to drive sustainability in the construction industry. Reduction of operational carbon emissions from buildings is the primary sustainable construction driver in the UK. UK Government has set an ambitious and legally binding target to reduce national greenhouse gas emissions by at least 80% by 2050 with an intermediate target of a 34% reduction by 2020 (against a 1990 baseline). In addition, the Energy Performance of Buildings Directive (EPBD) requires all new buildings to be 'nearly zero energy' by December 2020. In 2007, the UK Government announced its aspiration for new non-domestic buildings to be Zero carbon in operation by 2019 and began a lengthy consultation on the definition of ‘zero carbon’ for non-domestic buildings. As a minimum, Government stated that the zero-carbon ‘destination’ for non-domestic buildings would cover 100% of regulated emissions, i.e. a Building Emissions Rate (BER) of zero. 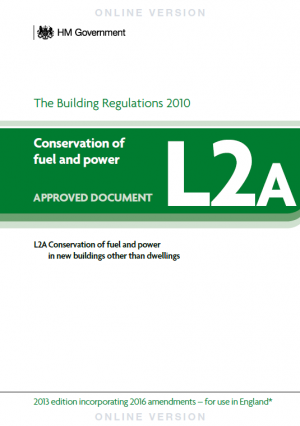 Regulated CO2 emissions are those building emissions that are regulated under Part L of the Building Regulations. Regulated emissions include those associated with the building fabric and fixed services; unregulated emissions include those from the use of cooking, appliances and IT equipment, etc. Carbon Compliance on or near site. This is the minimum level of carbon abatement required using energy efficiency measures plus on-site low and zero carbon (LZC) measures and/or directly connected heat or coolth. The proposal for commercial buildings, following the precedent set for domestic building, was to set minimum standards for carbon emission reduction by the use of energy efficiency and near or on-site low and zero carbon technologies, together known as Carbon Compliance. Energy Efficiency and Carbon Compliance targets are set based on their whole life cost effectiveness (calculated using discounted carbon abatement costs). This approach includes the assessment of energy efficiency measures, (e.g. thermal insulation), low and zero carbon technologies, (e.g. photovoltaics, wind turbines, etc) and Allowable Solutions to define the most cost effective national approach to reducing CO2 emissions from buildings. In July 2015, the UK Government announced that, as part of its Productivity Plan, the zero carbon buildings policy was to be dropped to reduce regulation on house builders. In particular, the Government stated that it ‘does not intend to proceed with the zero carbon Allowable Solutions carbon offsetting scheme, or the proposed 2016 increase in on-site energy efficiency standards. Government will keep energy efficiency standards under review, recognising that existing measures to increase energy efficiency of new buildings should be allowed time to become established. This effectively means that the 2016 zero carbon homes target has been dropped, as has a 2019 target for non-domestic zero carbon buildings. It also means that there will be no further changes to Part L in 2016. Approved Document L has evolved over recent years to implement the requirements of the EPBD at a national level and has a key role to play in defining suitable intermediate steps on the trajectory towards zero carbon buildings. Approved Document L is currently updated on a three year cycle with the next revision due in 2016, although a 2015 Government announcement made it clear that no changes will be made at that time. In addition, Part L1A (2013) has introduced mandatory Fabric Energy Efficiency Standards (FEES) alongside the existing CO2 emissions targets. The main requirement of Part L is that the calculated CO2 operational emissions rate from the building as built, is less than or equal to the Target CO2 Emissions Rate (TER) as set out in the Approved Documents. For non-domestic buildings, the Building CO2 Emissions Rate (BER) must be less that the TER. The BER and TER are calculated using a monthly quasi-steady state energy balance methodology SBEM (Simplified Building Energy Model) based on BS EN ISO 52016-1, with lighting from BS EN 15193-1, or by using approved dynamic simulation modelling software such as IES-VE or TAS. For residential buildings, the Dwelling CO2 Emissions Rate (DER) is calculated using the Standard Assessment Procedure (SAP 2009), a monthly energy balance methodology. These software packages produce a virtual model of the building. Standard operating conditions for each building type are defined in the National Calculation Method (NCM) and are applied to the building being assessed. The current version of Part L (for England) was published in 2013 and came into effect on 6th April 2014. Whilst there were amendments in 2016, there were no technical changes. Further revisions are expected on a three-yearly basis. As part of its strategy to implement the Energy Performance of Buildings Directive (EPBD), the UK Government introduced Energy Performance Certificates (EPCs) for all commercial and other non domestic premises greater than 50m2 in April 2008. EPC certificates give investors and occupiers the ability to make an accurate comparison of the energy efficiency of several commercial properties and compare the potential running costs before any purchasing or letting decisions are made. The commercial EPC survey must be carried out by a qualified non domestic energy assessor (NDEA). The EPC is required when a building is constructed, let or sold and is valid for a period of 10 years or until a newer EPC is produced. The EPC gives the theoretical (predicted) energy efficiency performance (the Asset Rating) of the building on a linear scale from A to G, where A is the most energy efficient, carbon neutral building. Each EPC is provided with an accompanying Recommendation Report providing options that could potentially improve the energy efficiency of the building and thereby the building’s individual EPC rating. The zero point on the scale is defined as the performance of the building that has zero net annual CO2 emissions associated with the use of the fixed building services as defined in the Building Regulations. This is equivalent to a Building Emissions Rate (BER) of zero. The border between grade B and grade C is set at the Standard Emissions rate (SER) and given an Asset Rating of 50. Because the scale is linear, the boundary between grades D and grade E corresponds to a rating of 100. The SER is based on the actual building dimensions but with standard assumptions for fabric, glazing and building services, etc. Display Energy Certificates (DECs) are required (since 2008) for buildings with a total useful floor area over 500m2 that are occupied by a public authority and institution providing a public service to a large number of persons. They are valid for one year for buildings with a useful floor area of more than 1,000 m2. DECs show the actual energy usage of a building (over a 12-month period), the Operational Rating, and the relative performance of the building compared to a typical building of the same type. The Operational Rating is based on the energy consumption of the building as recorded by gas, electricity and other meters. The DEC should be clearly displayed at all times and clearly visible to the public. A DEC is always accompanied by an Advisory Report that lists cost effective measures to improve the energy rating of the building. The Advisory Report is valid for seven years. As for EPCs, the DEC scoring system is based on an A to G scale. A building with performance equal to one typical of its type will have an Operational Rating of 100. A building that resulted in zero CO2 emissions would have an Operational Rating of zero, and a building that resulted in twice the typical CO2 emissions would have an Operational Rating of 200, etc. The Climate Change Levy (CCL) is a tax on the taxable supply of specified energy products (taxable commodities) for use as fuels that is for lighting, heating and power, by all business consumers. CCL does not apply to taxable commodities supplied for use by domestic consumers or to charities for non-business use. Coal and lignite; coke, and semi-coke of coal or lignite; and petroleum coke. CCL is charged at a specific rate per unit of energy. There is a separate rate for each of the four categories of taxable commodity. The rates are based on the energy content of each commodity and are expressed in kilowatt-hours (kWh) for gas and electricity, and in kilograms for all other taxable commodities. The rates are set by HM Revenue and Customs. Reduced rates are payable for participants in the Climate Change Agreement Scheme. The CRC Energy Efficiency Scheme (previously known as the Carbon Reduction Commitment) is a mandatory carbon emissions reporting and pricing scheme to cover all organisations using more than 6,000MWh per year of electricity (equivalent to an annual electricity bill of about £500,000). These organisations are responsible for around 10% of the UK’s emissions. The CRC came into force in April 2010 and was replaced by the CRC Energy Efficiency Scheme in May 2013. The CRC Scheme is designed to improve energy efficiency and cut emissions in large public and private sector organisations. The CRC affects large public and private sector organisations across the UK, together responsible for around 10% of the UK’s greenhouse gas emissions. Participants include supermarkets, water companies, banks, local authorities and all central government departments. State funded schools were excluded from the CRC scheme from April 2013. The CRC scheme complements the role of Climate Change Agreements and the EU Emissions Trading Scheme, which are directed primarily at energy-intensive organisations. Organisations which participate within the CRC are required to monitor their energy use, and report their energy supplies annually. The Environment Agency’s reporting system applies emissions factors to calculate participants’ carbon dioxide (CO2) emissions on the basis of this information. Participants must purchase and surrender allowances to offset their emissions. Allowances can either be bought at annual fixed-price sales, or traded on the secondary market. One allowance must be surrendered for each tonne of CO2 emitted. The allowance price in Phase 1 has been set at £12 per tonne of CO2. The 'Merton Rule' is the planning policy, originally developed by Merton Council, which requires the use of renewable energy onsite to reduce annual carbon dioxide (CO2) emissions in the built environment. Merton developed the rule and adopted it in 2003, its impact was so great that it was adopted by the Mayor of London and many other councils in the UK. It has also become part of national planning guidance. Merton has played a key role in ensuring that renewable energy policies became embedded into the mainstream, and was instrumental in persuading the UK Government to include an addition in its national planning policy guidance (PPS22), confirming the legality of such policies. The latest UK planning policy document, the National Planning Policy Framework, includes moving to a low carbon economy in one of three overarching objectives of achieving sustainable development. The definition of what is referred to, as the 'Merton Rule' is a borough wide prescriptive planning policy that requires new developments to generate at least 10% of their energy needs from on-site renewable energy equipment. The most commonly accepted threshold is 10 homes or 1,000m2 of non-residential development - though this is sometimes lower. This is the accepted definition by local (and regional) planning authorities, academic institutions, trade and professional bodies, and the development, construction and engineering industries. The reduction of operational carbon emissions is a key requirement of BREEAM. Energy is the highest weighted section within BREEAM 2018 (15%) and there are mandatory operational carbon requirements to achieve ‘Excellent’ and ‘Outstanding’ ratings. BREEAM sources data for the purpose of quantifying energy and greenhouse gas emissions from building energy modelling. This modelling must be carried out by design teams using approved software compliant with the UK's National Calculation Methodology (NCM). Total resulting CO2 emissions: This measures the amount of carbon dioxide emissions the building emits when meeting its operational energy demands. Modelled building performance, expressed as a percentage of the 2013 notional building level, is separately determined for the building’s modelled energy demand, consumption and CO2 emissions. The three individual ratios are then summed in to a single Energy Performance Ratio for New Constructions (EPRNC) through the use of weightings. The weighted ratios of performance are totalled to give an overall EPRNC which is then compared to a table of benchmarks to determine the number of BREEAM credits awarded. The higher the EPRNC the better the performance and the higher the number of credits achieved. Under the Kyoto protocol of 1997, the European Union was required to make greenhouse gas reductions of 8%, i.e. to reduce its annual emissions by 330 million tonnes by 2008-2012. The original Energy Performance of Buildings Directive (EPBD-1) was a core response to this target. When the Directive was adopted in December 2002 there were 160 million buildings in the EU, and it was anticipated that the Directive could deliver 45 million tonnes of carbon dioxide reduction by 2010. It was clear therefore that there was a need to strengthen the provisions of the Directive and a more thorough and rapid implementation. At the same time it was acknowledged that there had been a wide range of responses from Member States to the provisions of the original Directive, and that this variability should not be allowed to continue. Hence the second directive (known as the ‘recast EPBD’ or EPBD-2) was drafted and adopted in May 2010, effectively replacing the original. It generally tightened up the performance standards, reduced the building size thresholds which trigger certain actions, and strengthened the requirements for display of information and inspection of plant. In April 2010, the Government introduced a system of feed-in tariffs (FITs) to incentivise small scale, low carbon electricity generation by providing ‘clean energy cashback’ for householders, communities and businesses. These FITs work alongside the Renewables Obligation, which will remain the primary mechanism to incentivise deployment of large-scale renewable electricity generation, and the Renewable Heat Incentive (RHI) which will incentivise generation of heat from renewable sources at all scales. A generation tariff that differs by technology type and scale, and is paid for every kilowatt hour (kWh) of electricity generated and metered by a generator. This generation tariff is paid regardless of whether the electricity is used onsite or exported to the local electricity network. An export tariff which is either metered and paid as a guaranteed amount that generators are eligible for, or is, in the case of very small generation, assumed to be a proportion of the generation in any period without the requirement of additional metering. When introduced, the scheme supported new anaerobic digestion, hydro, solar photovoltaic (PV) and wind projects up to a 5MW limit, with differing generation tariffs for different scales of each of those technologies. All generation and export tariffs are linked to the Retail Price Index (RPI), and FITs income for domestic properties generating electricity mainly for their own use are not taxable income for the purposes of tax. Tariffs are set through consideration of technology costs and electricity generation expectations at different scales, and are set to deliver an approximate rate of return of 5 to 8% for well sited installations. Accordingly, the tariffs that are available for some new installations will ‘degress’ each year, where they reduce to reflect predicted technology cost reductions to ensure that new installations receive the same approximate rates of return as installations already supported through FITs. Once an installation has been allocated a generation tariff, that tariff remains fixed (though will alter with inflation as above) for the life of that installation or the life of the tariff, whichever is the shorter. As part of the Comprehensive Spending Review in 2010, the UK Government proposed to reduce Feed-in Tariffs (FITs) for new solar photovoltaic (PV) installations and in October 2011 DECC announced cuts of around 55% to tariff rates, with additional reductions for community or group schemes. The cuts were to be effective from 12 December 2011. This was successfully challenged in the high court. Lawyers for the Department of Energy and Climate Change immediately moved to appeal the ruling but the appeal was unanimously rejected by the Supreme Court, allowing anyone who installed their systems before 3 March 2012 to receive the higher rate of 43.3 p/kWh. Current FIT payment rates for pv and non-pv eligible installations are available from the ofgem website. In March 2011, the Government announced the details of the Renewable Heat Incentive (RHI) policy to revolutionise the way heat is generated and used. This is the first financial support scheme for renewable heat of its kind in the world. The aim of the scheme is to provide long-term financial support to renewable heat installations such as such as solar thermal technologies, biomass boilers and heat pumps, and to encourage the uptake of renewable heat. It will encourage the installation of renewable heat equipment. In the first phase, long-term tariff support is targeted in the non-domestic sectors. The scheme was opened for application from non-domestic generators in November 2011. Under this phase there is also support of around £15 million for households through the Renewable Heat Premium Payment scheme. The second phase of the RHI scheme will see it expanded to include more technologies as well as support for households. The RHI tariffs are tiered and are paid based on the heat output of the renewable energy system. For non-domestic systems, heat metering is required. Further details on the RHI are available here. Although currently there are no well established methodologies for objectively quantifying and assessing all three aspects of sustainable construction (environmental, economic and social), there are accepted procedures and tools for assessing the environmental impacts of construction activities and buildings. Most of these are national and the most widely used tool in use in the UK, (BREEAM), is increasingly being used internationally. In the UK, BREEAM (BRE Environmental Assessment Method) is the leading and most widely used environmental assessment method for buildings. It has become the de facto measure of the environmental performance of UK buildings. Although currently voluntary, many publically funded/procured buildings are required to have a minimum BREEAM rating. Many commercial building clients also recognise the benefits of procuring sustainable buildings and are increasingly using BREEAM to deliver sustainable buildings. BREEAM has certified over 200,000 buildings since it was first launched in 1990 although it is noted that by far the majority of these have been domestic. Pollution - air and water pollution issues. Each of the measures or ‘credits’ is either a mandatory, i.e. must be achieved for compliance, or voluntary. In addition, there are innovation credits which encourage exemplar performance or which recognise a building that innovates in the field of sustainable performance above and beyond the level currently rewarded by BREEAM . Credits are weighted according to environmental category and then added together to produce a single overall score on a scale of Unclassified, Pass, Good, Very Good, Excellent and Outstanding. Building projects are assessed by registered assessors and reviewed by a third party (BRE Global) before being awarded a certificate. Since 2008 it is compulsory under BREEAM to undertake a compulsory ‘Post Construction Review’ and to obtain a certificate at this stage. The Post Construction Review is based on ‘as built’ information and a site inspection of the completed building. BREEAM is updated on a regular basis to reflect best performance and to make it compatible with other requirements, such as Part L of the Building Regulations. The current version is BREEAM 2018. The revised Waste Framework Directive (2008/98/EC) which came into force on 2008. Article 40 required EU member states to bring into force the laws, regulations and administrative provisions necessary to comply with this Directive by 2010. The Directive provides the legislative framework for the collection, transport, recovery and disposal of waste, and includes a common definition of waste. The directive requires all member states to take the necessary measures to ensure waste is recovered or disposed of without endangering human health or causing harm to the environment and includes permitting, registration and inspection requirements. Revisions to the Waste Framework Directive have been implemented in England and Wales through the Waste (England and Wales) Regulations 2011 and ancillary legislation in Wales. The directive also requires member states to take appropriate measures to encourage firstly, the prevention or reduction of waste production and its harmfulness and secondly the recovery of waste by means of recycling, re-use or reclamation or any other process with a view to extracting secondary raw materials, or the use of waste as a source of energy. The directive’s requirements are supplemented by other directives for specific waste streams. 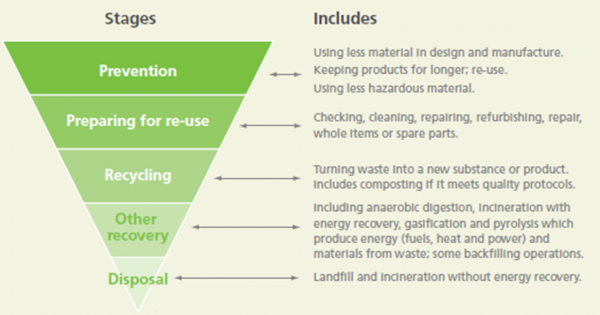 To improve the economics of the re-use and recycling sector by increasing sector demand and securing investment in the treatment of waste – this will benefit all waste streams, including construction. Reducing construction packaging waste by 20%. They keep all consignment notes for at least three years. If the company is a sub-contractor and the main contractor arranges for the recovery or disposal of waste that they produce, the sub-contractor is still responsible for those wastes under the duty of care. This duty of care has no time limit. It extends until the waste has either been finally disposed of or fully recovered. If companies produce or deal with waste that has certain hazardous properties, they will also have to comply with the hazardous/special waste regulations. Waste that has hazardous properties which may make it harmful to human health or the environment is known as hazardous waste in England, Wales and Northern Ireland and special waste in Scotland. The definition of hazardous/special waste is relatively wide and covers objects that contain hazardous substances such as televisions and fluorescent light tubes. As a result, many companies are likely to produce some form of waste that is hazardous and need to deal with it accordingly. Hazardous waste is classified using the European Waste Catalogue. The environmental regulator, the Environment Agency in England and Wales, tracks the movement of hazardous waste through the consignment note system. This ensures that waste is managed responsibly from where it is produced until it reaches an authorised recovery or disposal facility. Companies must ensure that all hazardous waste is stored and transported with the correct packaging and labelling. Hazardous waste can only be disposed of at a landfill site that is authorised to accept it. Some landfill sites that are classified as non-hazardous may be able to take certain stable non-reactive hazardous wastes if they have the appropriate facilities. A landfill site authorised to accept hazardous waste may not be able to take all types of hazardous waste. For further information on current legislation with respect to construction waste see the Environment Agency guidance. Introduced in 1996, the Landfill Tax remains the primary fiscal incentive to promote good waste management practice in the UK. The tax rose by £8 per tonne each year from 2007 up until 2014 and the standard rate was £80 per tonne at April 2014 for non-hazardous (and non-inert) wastes. The Government then announced that from 2015-16 it would rise in line with inflation and from 1 April 2016 it was £84.40 per tonne. A lower rate of £2.65 per tonne applied to inactive (or inert) waste at the same time. Reflecting the large volume of aggregates consumed by the construction industry (over 200 Mt pa), the Aggregates Levy was introduced in 2002 to reduce demand for primary aggregates and to encourage the use of recycled and secondary aggregates. The levy is currently £2.00 per tonne of primary aggregates. The Regulations also require a more detailed analysis to be conducted on projects costing more than £500k. Although the Site Waste Management Plans Regulations Act 2008 was repealed on the 1st December 2013 as part of Government’s Red Tape Challenge, SWMPs continue to be used on many construction sites and by responsible contractors. BREEAM is BRE’s Environmental Assessment Method for buildings. Under BREEAM, credits are awarded under a number of environmental categories, one of which is waste, and the buildings rated according to its total score. Improving resource efficiency through developing a pre-demolition audit and a Resource Management Plan, maximising the recovery of material during demolition and diverting non-hazardous waste from landfill. Encouraging the use of recycled or secondary aggregate or aggregate types with lower environmental impact to reduce waste and optimise material efficiency. Encouraging the diversion of operational waste form landfill through the provision of space and facilities allowing the segregation and storage of recyclable waste. Specification of floor and ceiling finishes only where agreed with the occupant or, for tenanted areas where the future occupant is unknown, installation in a show area only, to reduce wastage. Encouraging consideration and implementation of measures to mitigate the impact of more extreme weather conditions arising from climate change over the lifespan of the building. Encouraging consideration and implementation of measures design options related to adaptability and disassembly, which can accommodate future changes to the use of the building and its systems over its lifespan. BREEAM does not specifically address any issues in connection with demolition waste reduction or management although credit Wst 02 does encourage the use of recycled and secondary aggregates. The most highly weighted waste issue under BREEAM is Construction waste management (Wst 01) under which credits are awarded according to the benchmarks shown in the table. WRAP’s Construction programme is working to set standards for good practice in waste and resource management for the CD&E sector. WRAP provides free access to tools and know-how so that construction projects can make best use of materials resource and, in doing so, create real commercial value for the industry. In 2008, WRAP launched its Halving Waste to Landfill (½W2L) campaign, which was a voluntary agreement that provided a framework through which industry could support and deliver against the target of halving waste to landfill by 2012. Report annually on overall corporate performance. In 2015, WRAP announced that over 800 companies had signed the commitment to reduce waste leading to 5 million tonnes of waste per year diverted from landfill and £400 million cost savings per year realised by the companies involved. At the same time however, it announced its intention to focus its future efforts on resource management, food sustainability and product sustainability. Greater attention is being paid to the sustainability credentials of the materials used to construct buildings although there are currently no mandatory regulatory requirements. In particular, as the regulated operational carbon emissions of buildings are reduced, greater attention is being placed on the embodied carbon impacts of construction materials and products. The 'Green Guide' provides designers and specifiers with ‘easy-to-use’ guidance on how to make the best environmental choices when selecting construction materials and components. The current (4th edition) contains more than 1200 specifications used in different building types. The Green Guide information is also available from the Green Guide to specification website. The Green Guide is important because it provides the principal means by which environmental impacts of materials is assessed under BREEAM. The environmental data on which the Green Guide is based, are also used in other tools produced by the BRE including IMPACT. The Green Guide ratings are derived using BRE’s Environmental Profiles Methodology. This whole life cycle assessment methodology accounts for 13 different environmental impacts which are normalised and aggregated using expert-derived weightings, to yield a single-value in Ecopoints (one European citizen’s annual impact is equivalent to 100 Ecopoints). For each element, e.g. upper floors, external walls, etc. the range from the best to the worst performing specifications is divided into six equal parts and each segment rated on a scale of A+ to E.
Carbon foot-printing or embodied carbon assessment is increasingly being used within the construction industry to inform building design and product selection. Although this is currently on a voluntary basis, it is likely that some form of regulation, possibly via Part L of the Building Regulations, will be introduced in the future. A carbon footprint tool for buildings is available. In response to the plethora of different sustainability schemes being developed in Europe, the European Commission issued a mandate to the European Committee for Standardisation (CEN) to development horizontal standardised methods for the assessment of the integrated environmental performance of buildings. Subsequently the remit was broadened to include social and economic dimensions. Defines the conditions under which construction products can be compared based on the information provided by EPD. For the EPD of construction services the same rules and requirements apply as for the EPD of construction products. The importance of European Standards is that EU Member States, including the UK, have to use European Standards where they exist when regulating and National Standards must be withdrawn if they are in conflict with European Standards. So if the UK decides to regulate on measuring the sustainability of buildings and construction products then the UK will have to use the CEN/TC350 standards. There is a growing demand within construction supply chains to demonstrate that materials, products and services are being responsibly sourced. Producers are required to demonstrate their credentials to contractors who, in turn, need to show their clients that their buildings have been responsibly procured and resourced. Responsible sourcing of construction products is included within the Government’s 2008 Sustainable Construction Strategy which includes the target to develop Framework Standards to facilitate the development of sector Responsible Sourcing schemes. Since 2008, two standards have been produced: BES 6001 and BS EN 8902. Developed by BRE, BES 6001 provides a framework against which all construction products may be assessed. The framework comprises a number of criteria setting out the requirements of an organisation in managing the supply of construction products in accordance with a set of agreed principles of sustainability, the precise scope of which is determined by stakeholder engagement. Responsible Sourcing is also included within BREEAM 2018. All materials used to construct a building are assessed for the level of certification achieved. Recognised schemes include BES 6001, environmental managements systems (EMS) such as ISO 14001 and Forestry Stewardship Council (FSC) certification. The UK planning system has an important and overarching role in delivering sustainable development. The aim of the planning system is to help ensure that development takes place in the public interest and in economically, socially and environmentally sustainable ways. It also has a role to play in helping to cut carbon emissions, protect the natural environment and deliver energy security. The planning system in England requires each local planning authority to prepare a local development framework (LDF) which outlines how planning will be managed for that area. In determining planning applications, local planning authorities (usually the district or borough council) must have regard to their LDF. Planning authorities are also responsible for development management. This includes statutory requirements on publicising, consulting on and determining most applications for planning permission, taking into account the opinions of local people and others. The National Planning Policy Framework, first published in March 2012, effectively replaced all previous Planning Policy Statements (PPS).The framework gives guidance to local councils in drawing up local plans and on making decisions on planning applications. It states that Local Plans should be based upon and reflect the presumption in favour of sustainable development, with clear policies that will guide how the presumption should be applied locally. Most planning policy relates to relatively high level decision making such as where and if new development should be permitted. At the local level however, many planning authorities have prepared supplementary planning guidance (SPG) and supplementary planning documents (SPD) which provide more detailed guidance applicable at the individual project level; guidance can be either topic or site specific. SPGs and SPDs are one of the 'material considerations' taken into account when determining planning applications. Most planning authorities are replacing SPG with SPDs which form part of the authorities’ Local Development Framework. Many local planning authorities have prepared SPG/SPD that specifically address sustainable design and construction. In terms of scope these documents are often closely aligned with national assessment schemes such as BREEAM, however many documents vary significantly between different authorities and many include different issues and targets. In terms of material selection, most documents refer to the Green Guide to Specification ratings as the means of assessing environmental impact. At the project level, the so-called Merton rule has been adopted by many planning authorities and therefore can be significant with regards to the operational energy demand of buildings and the provision of renewable energy technologies. 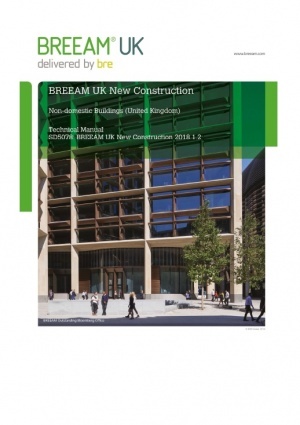 ↑ 16.0 16.1 16.2 16.3 BREEAM UK New Construction, Non-domestic buildings (All UK), Technical Manual, SD5078: BREEAM New construction 2018 1.0. BRE Global Ltd.
↑ PAS 2050:2011 - Specification for the assessment of the life cycle greenhouse gas emissions of goods and services, BSI.